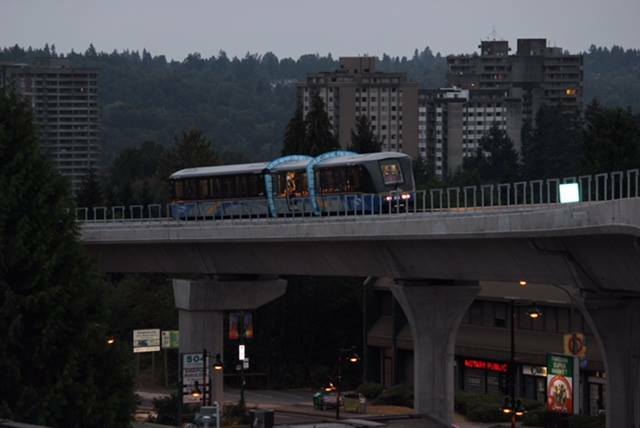 Another milestone with the SkyTrain Evergreen Line has been reached as trains are now running on certain elevated track sections for the testing phase of the project. 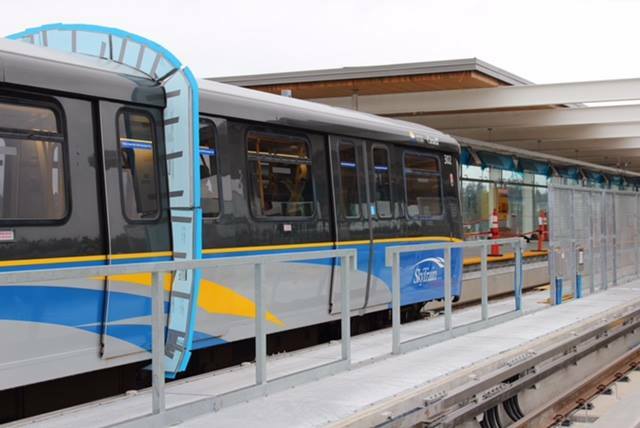 Trains began to operate on the section of completed elevated guideway on North Road between Lougheed Town Centre and Burquitlam stations last week. The trains will be operated in both manual and automatic modes for clearance testing, automatic train control testing, speed testing and multiple train testing. According to the Evergreen Line Project Office, train testing will be conducted from 11 p.m. to 6 a.m. over the next several months, during the off-peak hours at late night and on weekends when the SkyTrain Millennium Line is not in service. Trains will run at various speeds along the at-grade, elevated and tunnelled sections of the system. Other areas of the new SkyTrain extension will be tested incrementally, including the eventual system integration tests to the existing SkyTrain Operations and Maintenance Centre near Edmonds Station on the Expo Line. Testing is currently limited to the southern section of the line ending at Burquitlam Station, the area immediately south of the tunnel portal. All elevated sections of the Evergreen Line were completed in March 2015. However, construction issues with the two kilometre bored tunnel segment between Burquitlam Station and the intersection of Barnett Highway and Clark Road have forced project officials to delay the opening of the line until the fall of 2016. Poor and loose soil conditions have caused four sinkholes to appear along the bored tunnel route, with the latest depression occurring in June 2015. The $1.4 billion, 11 kilometre extension with seven stations was originally scheduled for a summer 2016 opening. It is anticipated that the service will draw 50,000 riders per day upon opening and 70,000 riders per day by 2021. When complete, the Evergreen Line will become a seamless direct extension of the existing Millennium Line: it will take commuters under 35 minutes to travel from VCC-Clark to Lafarge Lake-Douglas stations and just 15 minutes from Lougheed Town Centre to Lafarge Lake-Douglas stations.